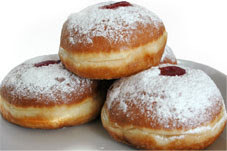 There's a new reason to scarf down donuts on Chanukah this year in Israel. There's also a new reason (the same one) to avoid them. "Adults await sufganiyot no less than children do," a source from the company that imports "Hortiza", the vodka to be infused into the donuts, said. "Therefore," he added, "we have decided to launch a line of donuts suitable for adults and party-goers." The vodka contains 35% alcohol, and the alcohol content of each donut is equal to that of a bottle of beer. That's a pretty powerful donut. Vodka donuts will be sold only to adults who present an appropriate ID to comply with local law.